More than 8,000 people crowded a sold-out event Feb. 11 at the RusSki Gorki Jumping Center to watch the inaugural women's ski jumping event at the Sochi Olympic Winter Games. Jessica Jerome, Sarah Hendrickson and Lindsey Van at a pre-event press conference. The RusSki Gorki Jumping Center at Krasnaya Polyana. U.S. friends, family and friends during the normal hill event debut for women at RusSki Gorki Jumping Center. First round of the women's normal hill event on Feb. 11. Sarah Hendrickson after jumping the first round in the normal hill event. Lindsey Van jumping for the first time in the Olympic Winter Games. Lindsey Van said that finally participating in the Winter Games was "the best thing ever." Valerie Tschui, WSJ-USA physical therapist, cheers during competition time. 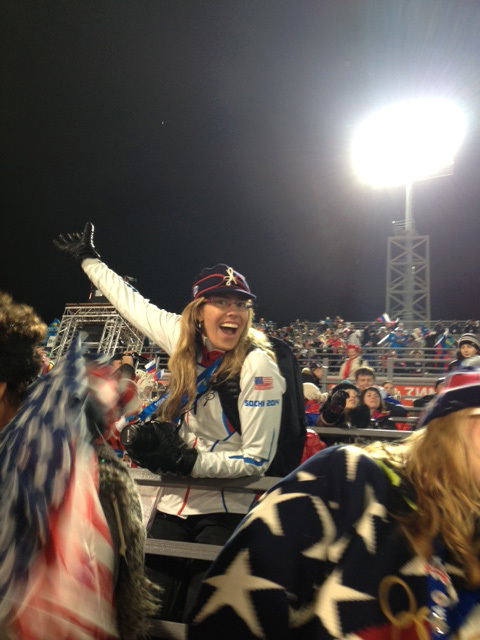 USSA's Lauren Loberg - queen of the fan section. Jessica Jerome - the top finisher for the U.S. team with a 10th place. History made. More than 8,000 people crowded the RusSki Gorki Jumping Center to watch the women jump for the first time in the Games while media outlets crowded the mixed-zone. Sarah Hendrickson talking with reporters after the historic event. Lindsey Van talks with a group of women sports journalists from the U.S. after the historic event. Lindsey Van with friend and ski jumping advocate and judge Blair Tomten. Deedee Corradini, Bill Hendrickson, Nancy Hendrickson, Peter Jerome and Barbara Jerome participated in a pre-event press conference. Post-event WSJ-USA photo: PT Valerie Tschui, Sarah Hendrickson, Lindsey Van, Media Director Whitney Childers, Jessica Jerome and Head Coach Alan Alborn. Jerome family and friends at the set of NBC's Today Show on Feb. 12. The Olympic flame at the Coastal Cluster in the Olympic Village. France's Coline Mattel celebrates as she's awarded the bronze during medal ceremonies for the first ever women's ski jumping event in the Olympic Games. Anita DeFrantz and Nawal El Moutawakel (International Olympic Committee members) pictured with WSJ's Deedee Corradini. Lindsey Van, Peter Jerome, Jessica Jerome and Sarah Hendrickson. Another 200 media snaked a mixed-zone, waiting to chat with the medalists and the U.S. women who led the push to get their sport in the Games. Before the event, parents of the jumpers and Women's Ski Jumping USA president Deedee Corradini took part in a press conference to share their daughters' story.